There has been a lot of talk about modular knitting and mitered squares on the KWON forums this last week. 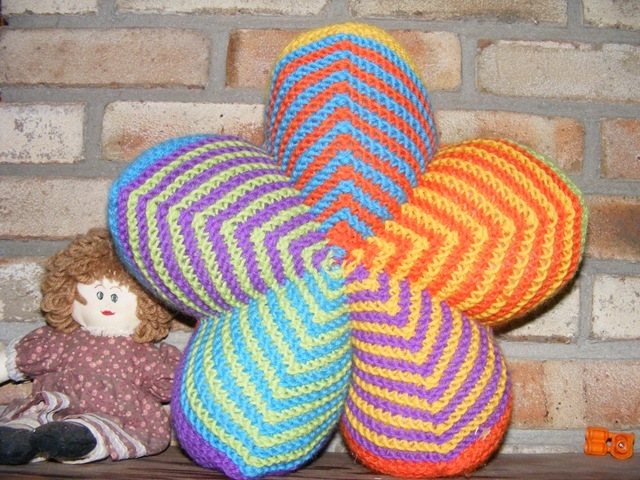 It made me realize that I had neglected to post my Mitered Square Tutorial here! It was first published in the Summer Issue of Loom Knitters Circle this year and I hope you all enjoy it! How to Make Mitered Squares on a Knitting Loom! 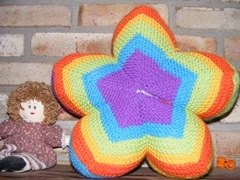 I have had some fun with the mitered squares.. most notably my star travel pillow! It is made on the Mini Wonderloom in extra small gauge from Décor Accents, which turns out to be just right for making mitered squares. The new Loom Clips from Provo Craft are really excellent as well, as you only have to move the clip, slip the center stitches over them and keep working. No shifting of stitches involved! So enjoy and as always if you have any questions… let me know! This entry was posted in How To's Day, Knitting Without Needles by Denise. Bookmark the permalink. For the squares how many stitches did you cast one? how many stitches would you cast on the wonder sock loom to make a 4 inch square?